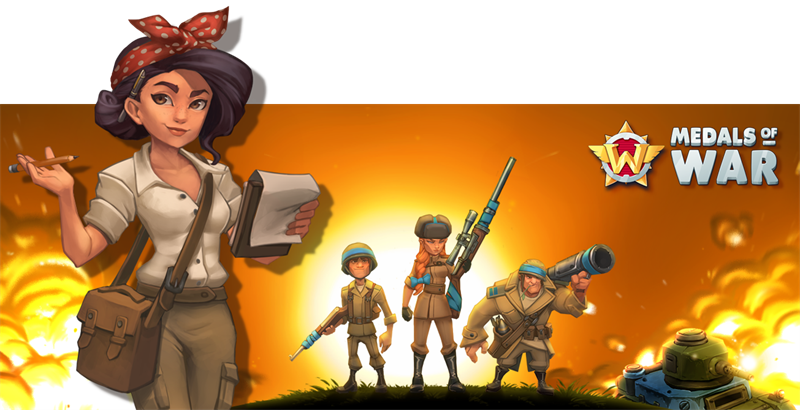 Medals of War brings WW2 fantasy with real-time PvP battles on mobile to a grown-up audience. On this date, Nitro Games revealed the art style and first characters of the upcoming game, Medals of War. The look and feel of the game represents WW2 fantasy – A humorous take on the mid-19th century military themes. The game is set in Warland, which is an over-the-top militaristic world of battling autonomous armies, led by Commanders (the player). The game features a wealth of different characters, machines of war and environments. The narrator and the link between the game and the real world is a beautiful and savvy war correspondent Flower Adams. For the player, there’s a huge variety of different decks, officers with special powers and battle tactics to build and customize. The battle environments take the player through the landscapes of Warland - from the fields and forests, through the war torn cities all the way into the piercing cold of the North.